It’s Thursday, which means the weekend is almost upon us! Not really. I normally walk casually to my car after having wished my coworkers a “Have a good weekend!” or exchanged the obligatory, “Any plans this weekend?” I may exchange an awkward high five and “Happy Friday!” as well, but that’s about as crazy as it gets. I look forward to the weekend, mostly because I’m a sucker for brunch. Having time to make brunch and enjoy it leisurely is one of my favorite Saturday activites. Eating brunch OUT is one of my favorite Sunday activities. See how happy brunch makes me?? Last fall I discovered Drip Cafe in Hockessin, Delaware and I’ve been back at least four times since then. Mostly because the food is excellent, but also because the owner sources ingredients locally (Lancaster Farm Fresh is a supplier). 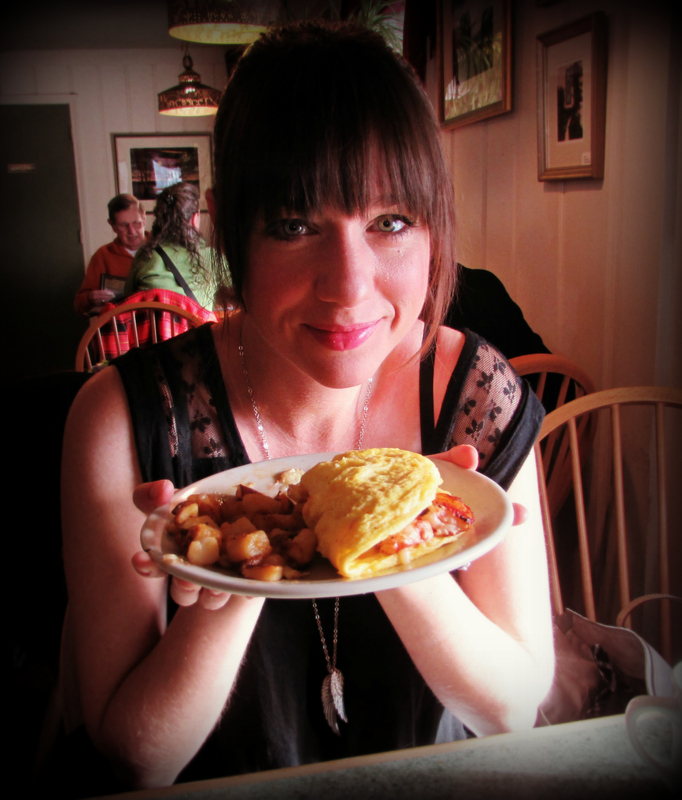 So far my favorite dishes are the Kale and Bacon Potato Hash and the Caramel Apple Pancakes. Okay, so I have two favorite dishes. But the food’s not the only reason to visit. 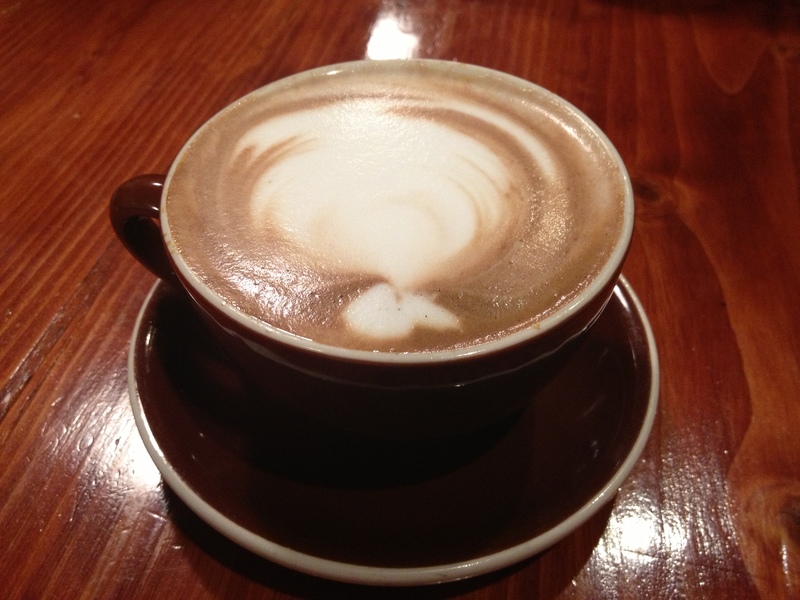 The staff is friendly, knowledgeable, and pleasantly picky about the way they brew coffee. Did I mention the Kale and Potato Hash comes with a SIDE OF MAPLE SYRUP? 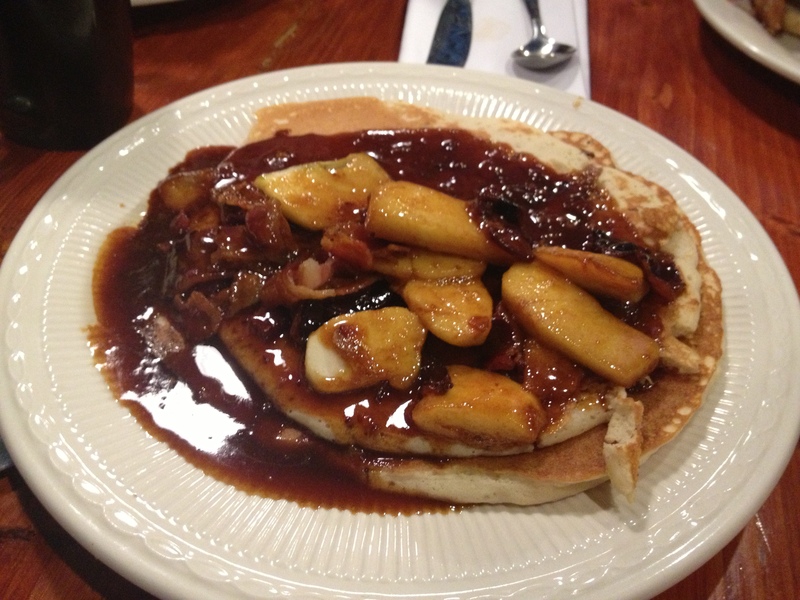 Did I mention that the Caramel Apple Pancakes are TOPPED WITH SMOKED BACON?? As far as brunch goes, Drip Cafe earns high praise from both my local, organic sensibilities and my taste buds. So tell me, are you a sucker for brunch, too? Do you prefer to cook at home or eat out? On a related note, are you a Bloody Mary or a Mimosa kind of person? Brunch is my favorite going-out meal and this looks like a great day-trip possibility. I’m hungry now. This place is a pleasant distance away from Longwood Gardens, too, which is beautiful this time of year. I love brunch. I love cooking it, but going out is a must when hungover! I do like Mimosas but if a place has a Bloody Mary bar, I’m all over that every time. I feel like I’ve seen you review a Bloody Mary bar over at FWH. I have to admit – I DON’T enjoy Bloody Marys. Not even a little. Am I missing something? Depends on how you feel about tomato juice. If you can get past that point, then you’re golden. A lot of them can be really plain, so the secret is pimping them out with extra worcestershire, tabasco, horseradish, and spices… Some of the bloody bars I’ve seen have all kinds of other goodies – shrimp, bacon, sausage, pickled beans or asparagus, peppers, etc. I think it must be the tomato juice and then you mention worcestershire and ugh. Bloody Mary bars always make me think of those pearl onions in a jar – maybe I’m not going to the right Bloody Mary bar. Brunch makes me terribly happy … but only if the coffee is good. Well, the food has to be good but the coffee can be a deal breaker. My husband is a bloody mary guy. I’m just in it for the coffee. The coffee MUST be good. I think coffee is much more important than even mimosas at brunch (don’t tell Jules I said that). ssshhhhh … it’s OK. We’ll bribe her with bacon. I ADORE BRUNCHES!!! Can’t wait to go to Mother’s Day Brunch coming up! I always request that as my gift. Those pancakes are to kill for! Mmmmmmmmm!!!!!!!!! Mother’s Day brunch is such a great tradition. Brunch is always just a little fancy. Yes, the pancakes are divine! Enjoy your Mother’s Day brunch – I hope there’s pancakes covered in bacon and sugar!!! Well, I especially adore brunches when I can share lobster omelets over coffee with my fave peeps. 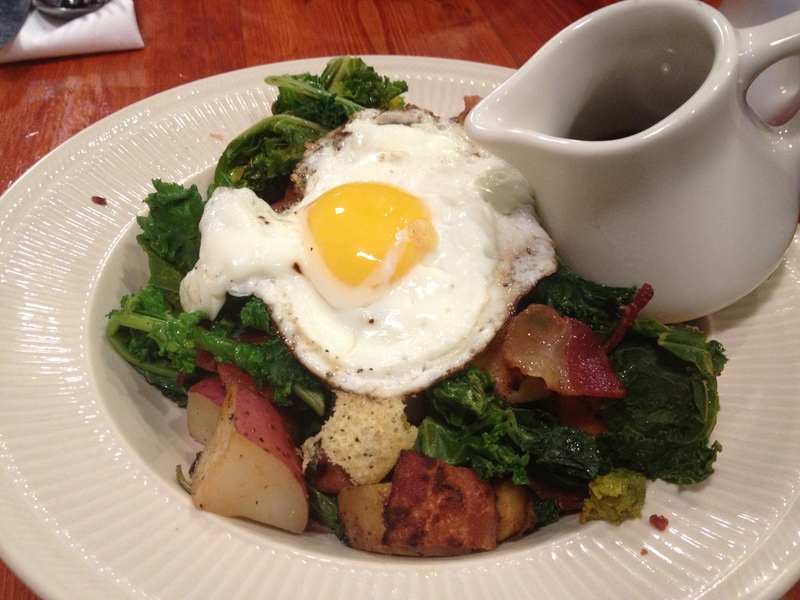 I have to say, that photo of the kale hash actually makes me want to eat kale, something I thought once impossible. Cover kale in maple syrup and bacon and I think anyone would like it. Whoooooaaaaaaa re: bacon on the pancakes! I think the post-BaconFest withdrawal is kicking in. You can cook me brunch (again) anytime, RP. As you know, I do love making myself a veggie omelet stuffed w/ cream cheese (side of marble rye), which always takes 10 times longer than I think it should, but nothing beats going out. Especially if the restaurant’s picky about the way they brew their coffee! MARBLE FREAKING RYE! Remember that marble rye we had whilst stuck in Massachusetts wondering how we were ever going to get to Maine??? I’d say it was almost worth the blown tire just to experience it. My husband and I had the habit of going to a new cafe every Sunday morning in the area for brunch. We discovered some wonderful places. My favourite dishes were Spanish blood sausage served with all the usual breakfast trimmings, and walnut, banana, bacon and maple syrup waffles. Miam. Love, love, love brunch. I get breakfast for lunch AND dinner, depending on the restaurant. 1) That kale hash looks might tasty. 3) Hi, Rach. How’s you? You are such a flatterer. Keep it up. Just tooling around on the internet and found this thread. Thanks for the local love, Rachel. Greg, and the Drip Cafe Crew. Thanks for stopping by, Greg. I LOVE The Drip Cafe. I was in there recently with out of town guests and they loved it too.